Naturalization is the process through which an immigrant to the United States can become a U.S. citizen. Only certain immigrants are eligible: those who either have been green card holders (permanent residents) for 3–5 years or meet various military service requirements. Becoming an American citizen comes with many advantages, and it also means taking on new responsibilities. This guide will help you understand how to become a U.S. citizen, including the requirements for U.S. citizenship, the whole application process, and the rights and obligations of a naturalized citizen. Who is eligible to apply for U.S. citizenship through naturalization? Who can apply for U.S. citizenship and when? * Consecutive or otherwise; any period of military service counts as having physically lived in the United States. ** A discharge designated “General-Under Honorable Conditions” is considered “honorable” discharge for naturalization purposes. If you’re a green card holder with no special circumstances, you can apply for U.S. citizenship at least five years after obtaining your green card. You also must have physically lived in the United States for at least 30 months (two-and-a-half years) out of those five years. If you’ve been married to a U.S. citizen for at least three years and lived with your spouse that entire time, you can apply for U.S. citizenship at least three years after obtaining your green card. You also must have physically lived in the United States for at least 18 months (one-and-a-half years) out of those three years, and your spouse must have been a U.S. citizen for at least three years. If you’re the widow or widower of a U.S. citizen who died while honorably serving in the U.S. military (and you were living with them at the time of their death), you can apply for U.S. citizenship at any time — as long as you’re a green card holder at the time of your citizenship interview. You need not have held a green card for a certain number of years or have physically lived in the United States for any number of months prior to applying. If you’ve served in the U.S. military for at least one year during peacetime, you can apply while in active duty or within six months of separating honorably from the military. You need not have held a green card for a certain number of years or have physically lived in the United States for any number of months prior to applying to become a naturalized citizen. 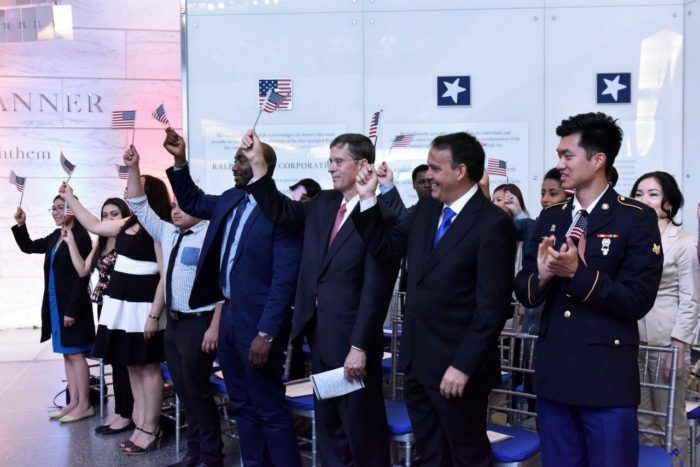 If you’ve served in the U.S. military for less than one year during peacetime, you can apply for U.S. citizenship five years after obtaining your green card (honorable service within this five-year period can count toward that required time, as well). You also must have physically lived in the United States for at least 30 months (or two-and-a-half years) out of those five years. If you’ve served in the U.S. military for at least one year during peacetime and are filing after six months of separating honorably from the military, you can apply for U.S. citizenship five years after obtaining your green card (honorable service within this five-year period can count toward that required time, as well). You also must have physically lived in the United States for at least 30 months (two-and-a-half years) out of those five years. If you’ve served in the U.S. military for any period during wartime, you can apply anytime and need not be a green card holder. You (or your military spouse) must only have been physically present in the United States (including U.S. territories) or aboard a U.S. vessel when you enlisted, re-enlisted, extended your service, or were inducted into the military. You need not have held a green card for a certain number of years (if you have one) or have physically lived in the United States for any number of months prior to applying for citizenship. Not sure if you’re eligible for naturalization? You can check your eligibility on Boundless without providing any personal information. When you’re ready to apply, Boundless can guide you through every milestone of the naturalization process, starting with your N-400 application all the way to the finish line. Learn more, or start your application now. You must not have taken any trips of six months or longer outside of the United States during the three- or five-year wait period. You must have been a resident of the state where you plan to apply for citizenship for at least three months. You must have “good moral character,” broadly defined as character that measures up to the standards of average citizens in your community. More specifically, however, it means you did not have certain types of crimes — such as murder, illegal gambling, or intentionally lying to the U.S. government in order to gain immigration benefits — on your record at any time before filing, and you did not lie during your naturalization interview. Whether an applicant meets this requirement is decided by the government on a case-by-case basis. You must pass a two-part naturalization test: the first is an English language test (covering reading, writing, and speaking skills) and the second a civics test (covering knowledge of U.S. history and government). You must be willing to serve in the U.S. military or perform civilian service for the United States if called upon to do so. You must register with the Selective Service System if you are male and have lived in the United States between the ages of 18 and 25. You must be willing to defend the U.S. Constitution. *Applicants aged 65 and older are required to study only 20 of the 100 usual questions that most applicants must prepare for. The test administrator will ask 10 of the 20 questions, but the applicant will need to answer only six correctly to pass. Boundless has more details on the citizenship test exceptions. Applicants with a physical or developmental disability or mental impairment may be exempt from the English and civics test requirement above. They may apply for the exemption by filing Form N-648 (officially called the “Medical Certification for Disability Exceptions”), which is completed by a medical doctor. Individuals who apply for naturalization based on at least one year of peacetime military service are exempt from requirement Nos. 2 and 3 above. To meet requirement No. 4, the applicant’s criminal record must be free of certain crimes at least five years before filing until they naturalize. Individuals who apply for naturalization based on any period of wartime military service are exempt from requirement Nos. 1 (they may be any age), 2, and 3 above. To meet requirement No. 4, the applicant’s criminal record must be free of certain crimes at least one year before filing until they naturalize. You must not have deserted (left before discharge) from the U.S. military. You must have never received a discharge or an exemption from the U.S. military based on your non-U.S. citizen status. How much does it cost to apply for naturalization? The current government filing fee for naturalization applications is $725, including $640 for processing and $85 for biometrics services. Military applicants are exempt from both the application filing fee and the biometrics fee. Applicants aged 75 and older are exempt from the biometrics fee (see our detailed guide to naturalization costs). What if I can’t afford the filing fee? If you cannot afford the filing fee for income-based reasons, you may apply for a fee reduction or waiver. For the flat rate of $395, Boundless helps you complete your entire naturalization application, including all supporting documents, independent attorney review, and support from the moment your application is filed until you obtain U.S. citizenship. Learn more about our services, or get started today. The following is a brief overview of the naturalization process. Make sure to also check out our detailed guide to the U.S. citizenship timeline to help you understand when each stage of the naturalization process takes place. The first step to becoming a U.S. citizen is to file an Application for Naturalization (Form N-400) and pay the filing fee (unless you are exempt — see above for details). You may fill out and mail a paper application or complete the application online. If you file online, you must first create an online account with U.S. Citizenship and Naturalization Services (USCIS). If you’re applying based on your military service, from abroad, or for a fee reduction or waiver, you may not complete your application online. You must mail your application to the appropriate USCIS office. The next step is to set up your biometrics appointment — basically, getting your fingerprints taken — at your local USCIS field office. As with the marriage-based green card process, USCIS will take your fingerprints during naturalization in order to conduct a background check. The fingerprinting appointment usually takes place about a month after USCIS receives your U.S. citizenship application. The citizenship interview is usually scheduled around 14 months after filing your application. Exactly how long it will take to process your naturalization application, however, depends heavily on the USCIS field office handling your case, which is assigned to you based on your ZIP code. During this interview, a USCIS officer will verify that all of the information on your naturalization application is correct. The interview usually takes place at the nearest USCIS office. If you are applying from abroad, you will attend the interview at a U.S. embassy or consulate. If you are in active military duty, your interview may be held at a military facility. But don’t panic! These tests are fairly basic, and USCIS provides study materials to help you prepare. You’ll also have two chances to take the tests per application: once during your interview and again at a later date to retake any portion that you didn’t pass the first time. If you pass the interview and exam, the USCIS officer will approve your application at the end of the interview. In some cases, USCIS may ask you for additional documentation or schedule a second interview. If you do not pass, USCIS will send you a denial letter explaining why, but you may appeal their decision within 30 days of receiving the letter or reapply. A USCIS policy on denied applications taking effect on September 11, 2018 underscores the importance of completing the naturalization application and meeting all requirements correctly the first time. You’re almost finished! Once your application is approved, you will attend an Oath of Allegiance ceremony. It’s very important that you complete this step. You are not a U.S. citizen until you have taken the Oath of Allegiance. After your citizenship interview, you’ll receive a notice in the mail with the date, time, and location of the ceremony (usually a local courthouse or USCIS office). The time it takes to schedule the ceremony varies by state. You’ll be asked to return your green card when you check in. Once the ceremony is over, you’ll receive a Certificate of Naturalization and begin your life as a U.S. citizen! Boundless can help you stay on top of interview preparation, follow-on forms, and every other important milestone along the way. Ready to start? You can travel with one of the most powerful passports in the world. Applying for a U.S. passport after receiving your Certificate of Naturalization is a major benefit of U.S. citizenship. With a U.S. passport, you can travel to more than 180 destinations for short-term trips without a visa, take as many trips abroad as you want for as long as you want, and seek assistance from the local U.S. embassy during times of trouble. You can obtain federal benefits available only to U.S. citizens. Upon naturalizing, you’ll gain full access to certain government assistance programs, such as Social Security and Medicare, which green card holders can access only for a limited time. You’ll also be able to take advantage of most federal college assistance programs that are not available to non-U.S. citizens. You can apply for a green card for your relatives. You’ll be able to sponsor your parents, adult children, and siblings for their own green cards. Your children automatically become U.S. citizens — even if they’re born abroad. You’ll simply need to report your child’s birth to a U.S. embassy or consulate. You no longer have to deal with immigration paperwork. You won’t need to renew your green card or pay immigration filing fees. You also won’t have to notify USCIS every time you move. You can apply for jobs with the U.S. government. Most federal employment is reserved only for U.S. citizens. Although every job has its pros and cons, federal employees and their families tend to receive relatively better benefits and earnings than private-sector workers. You can vote in any U.S. election. Only U.S. citizens can vote in federal elections. Non-citizens may only vote in some local elections. You can run for elected office. U.S. citizenship is required for federal office and for most positions in public office at the state and local levels. With Boundless, you get an independent immigration lawyer who will review your entire application package and answer any extra questions you might have — for no additional fee. Only after this independent lawyer has confirmed the readiness of your application package will Boundless mail it to you for filing with the federal government. Learn more, or start your application now. You may be required to renounce your citizenship in other countries. Depending on your home country’s rules for dual citizenship (being a citizen of two countries at the same time), you may need to give up your current citizenship upon becoming an American. The United States permits dual citizenship, but it requires U.S. nationals to use their U.S. passports when traveling in and out of the United States. Many countries — Australia, Canada, and the United Kingdom, for instance — also allow you to be a national of another country. India, Japan, and a number of others, however, require you to relinquish your citizenship in those countries once you become an American. It’s best to check your home country’s policy on dual nationality before applying for naturalization if you intend to maintain your citizenship in that country. You may be called upon to serve in the military. Mandatory military service enforced by a draft was officially discontinued in 1973. If reinstated, however, you could be drafted to serve. Any male who is a U.S. citizen or green card holder and has lived in the United States between the ages of 18 and 25 must register with the Selective Service System. You may need to serve on a jury. In the United States, jury duty in a legal proceeding is mandatory. If summoned, you must attend, but you may not necessarily serve. Only those who are selected by the judge and attorneys after being summoned will actually serve on the jury. Active-duty military service members, professional fire and police department workers, and some public government officers who serve full time in their positions are exempted from federal jury duty. Individuals who have served on a federal jury in the past two years, are aged 71 and older, or are volunteer first responders generally may request to be excused from service, but policies vary by district court. State and local courts impose their own rules but generally also exempt individuals based on age, disability, or their positions in public office. You must file U.S. income tax returns for life — no matter where you live. As a U.S. citizen, even if you move abroad, you must still file U.S. income tax returns. As long as you meet certain requirements, though, you’ll be able to exclude from your income up to the yearly limit — currently over $100,000 — allowed by the U.S. government, meaning it won’t be taxed. Any income that exceeds that limit will generally be taxed. Your criminal history will be heavily scrutinized. If you’ve committed a crime that could make you deportable — such as immigration fraud, drug abuse, or domestic violence — it’s especially important to seek legal assistance before applying for naturalization. Do you have confidential questions about your eligibility for U.S. citizenship? With Boundless, you get the confidence of an independent immigration lawyer who will answer any questions you have and review your entire US citizenship application — for no additional fee. Let’s begin! What do the terms “peacetime” and “wartime” mean? Although peacetime naturalization is always an option for any applicant with at least one year of military service, anyone eligible for wartime naturalization would almost certainly choose that path instead. How Much Does Naturalization Cost? How Long Is the Naturalization Process?